A problem that seems to be growing and to be continually getting worse is the issue of shortages and the unavailability of critically needed pharmaceuticals. This is an issue that has been around for quite some time, for example see this overview that I penned back in 2002. 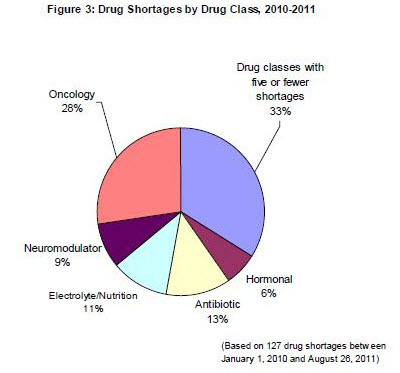 However, over the past few years the frequency and length of the shortages, the critical nature of the drugs involved, and their negative impact have been growing and have approached alarming levels. 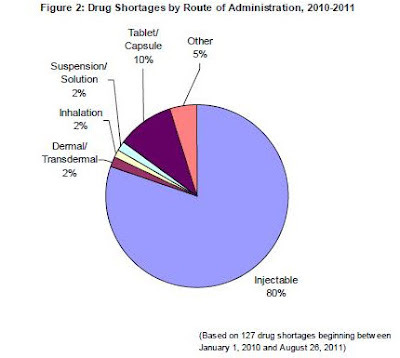 One result is that the visibility of the issue has greatly increased - stories and articles about drug shortages (both in general and related to specific drugs) have migrated from mainly being covered by the 'trade' press to appearing in national and local news outlets (newspapers, radio, television, etc.). Their frequency has also increased, and shortage-related stories now appear as a weekly, if not daily, staple of the news. Additionally, coverage has spread from 'hard news' outlets to a myriad of other outlets - general magazines (e.g. Wired), blogs, etc. So, is it possible that drug shortages are now some sort of Rorschach test, in which one's reaction to the issue can be considered "projective" i.e. the issue allows one to project his or her real biases into the issue via his/her interpretation of the causes and the steps that need to be taken to resolve the issue? 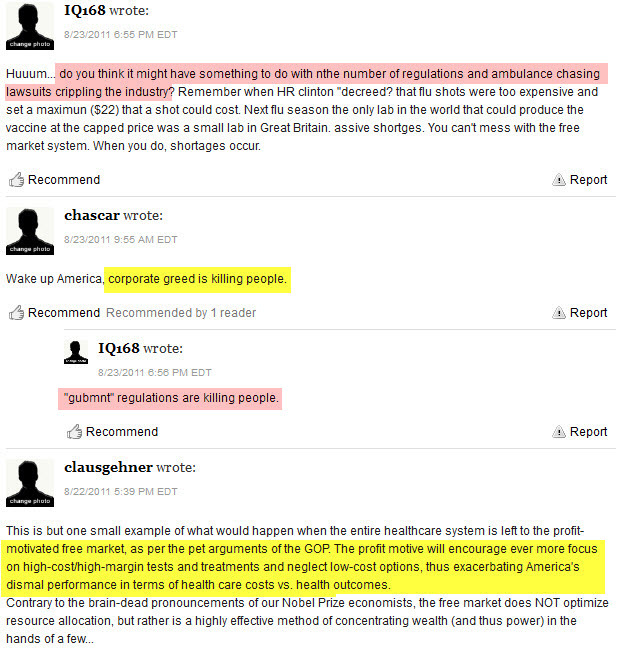 A common characteristic of most of the coverage and the readers' comments is that they boil down what is a very complex issue to simple (and usually simplistic) answers: One answer, the problem is caused by the greed of the pharmaceutical companies, who are actually deliberately causing the shortages. 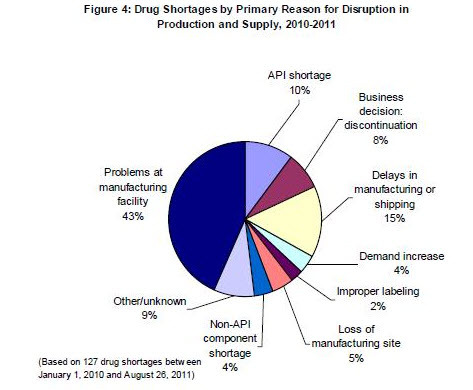 Presumably the thought here is that the shortages will lead to increased prices, and thus higher profits. A minor variation on this theme is that the manufacturers cause the problems by under-investing in their facilities. Again, the cause is greed, the deliberate under-investment being to fatten margins. 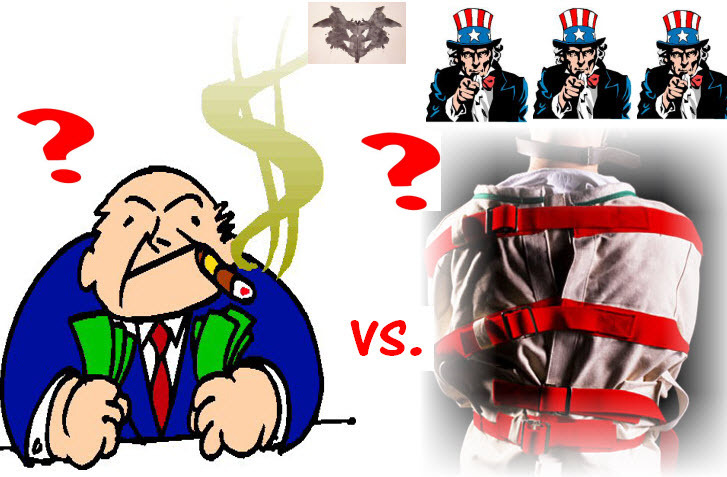 However, drug pricing is not elastic, and when a manufacturing line shuts down the pharma company loses money as it has no sales income while it still has the cost of the plant. 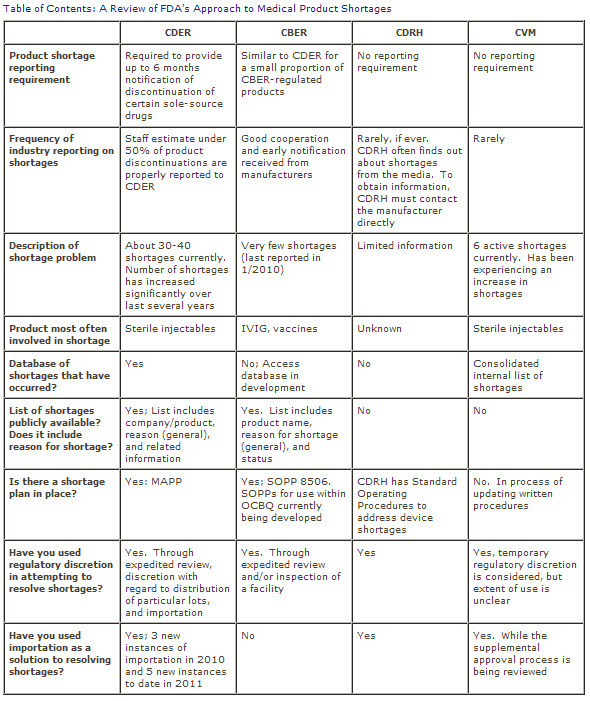 Additionally, its contracts often contain "failure to supply" clauses, obligating the pharma company to reimburse providers if they incur additional costs sourcing alternate, higher-priced product (assuming an alternative exists). Thus causing manufacturing problems (either deliberately or inadvertently) hardly seems to be a viable strategy. 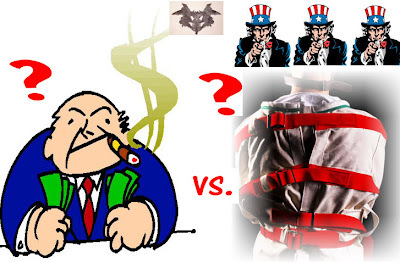 The opposite answer, the problem is caused by the government via unnecessary burdens including onerous legislation, red tape, price controls, and other government inspections, controls and regulations... If only the government got off the pharma companies' backs, all would be well. This too is overly simplistic, the inspections, controls, and regulations are there to protect the public, and we have seen what happens when these do not work (e.g. the recent heparin problems). Those decrying them are often the first to call for someone's head when a failure does occur and products get through that hurt consumers! The size and scope of the problem is such that it is difficult to see a solution. However, everyone agrees that "something needs to be done" this usually by someone else. At a recent FDA public meeting to discuss drug shortages, presenter after presenter came up to provide stories of shortages and how they adversely affect one group or another - Oncologists testified how shortages of life-saving chemotherapy drugs put the lives of their patients at risk; pharmacists testified how shortages of drugs have affected their patients, including the cancellation of necessary surgeries due to shortages of anesthesia drugs; patients with esoteric diseases testified how shortages of simple electrolytes and parenteral nutrition drugs threaten their survival; pediatricians told stories of kids at risk because needed therapeutic drugs were unavailable; and researchers testified how research studies and protocols for future drug breakthroughs are put at risk due to difficulties in the procurement of some of the drugs involved. Each had multiple, excellent reasons why their patients needed the drugs, all were unanimous that the situation was unconscionable and that action was needed, but few (if any) had concrete suggestions for solutions to the problem! 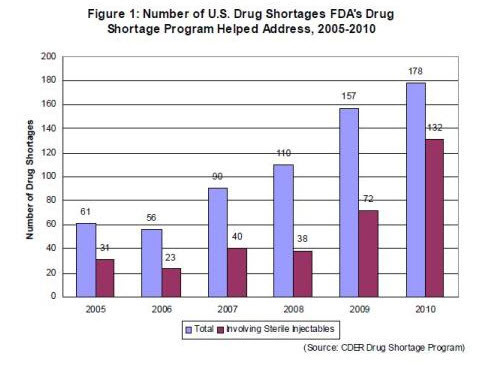 The FDA representatives present were at pains to spell out all that they do and to take credit that the situation would have been worse had they not succeeded in averting a number of shortages, but even they had few answers! Add "something needs to be done" to what seems like a huge and insoluble problem and many automatically turn their thoughts to legislation and a governmental role in the solution! An apparently unquenchable thirst for simple, one dimensional answers. A willingness to ascribe the worst motives to others. A "something needs to be done" reflex that, allied with a feeling that the problem is so much bigger than one can handle, can inexorably lead to a 'government action is the only viable option, and legislation - generally coercive - is the main answer' response. With all of the above reinforced by shoddy reporting, and the best efforts of the political classes (on a bicameral and bipartisan basis) to implement band-aids and/or ill-considered solutions! 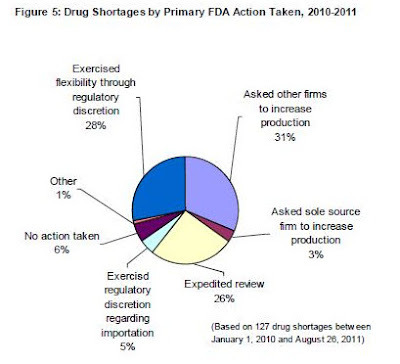 The Number Of Drug Recalls Is Rising How Fast? The identification and remediation of many market-distorting rules and regulations (example: cost reimbursement methodologies that may distort/influence prescribing patterns); closer cooperation, even integration, between the FDA and pharma manufacturers; increased flexibility on both sides (e.g. pharma ramping up production where possible to mitigate shortages; the FDA expediting reviews and approvals, looking at extending expiration dating where feasible, perhaps non-recall actions (e.g. 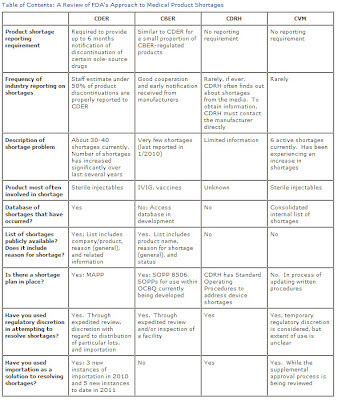 'dear Doctor' letters) in response to some non-product issues with labeling and/or 'paperwork', expedited product specification changes, etc. ); improved transparency on all sides; increased collaboration in developing responses to raw material availability issues or to natural disasters effecting production; and many more. Random charts - "Buffet tax"